Transport Secretary Chris Grayling has today (24 October 2017) set out the next stage of delivering a third runway at Heathrow Airport. The government is on track to publish final proposals for expansion at Heathrow in the first half of 2018 for a vote in Parliament. Now the public have until 19 December to consider and respond to new evidence in the revised draft Airports National Policy Statement, including long term aviation forecasts and the new government National air quality plan. Once MPs approve the final document, it will set the planning policy framework which the airport needs in order to bring forward a planning application for the new north-west runway. An expanded Heathrow Airport would be more accessible to the rest of the country thanks to HS2, Crossrail and at least 6 more domestic flight routes. "Airport expansion is one of the most important type of infrastructure project for the UK – both in boosting our economy and jobs and promoting us on the world stage. "Leaving the EU is a new chapter for Britain and provides us with a great opportunity to forge a new role in the world. We are determined to seize that opportunity and having the right infrastructure in place will allow us to build a more global Britain. 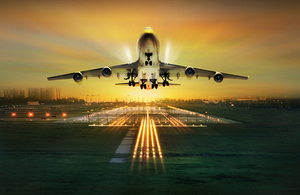 "The case for expanding Heathrow is as strong as ever and we want to hear your views on it. This is an important consultation and I encourage everybody to get involved across the UK." On 25 October 2016, the Transport Secretary confirmed that the government’s preferred scheme for adding new runway capacity in the south-east was through a new north-west runway at Heathrow Airport. This preference was reached in the interests of the whole of the UK and would make sure Britain has the connections it needs to thrive in the global market, sending a clear signal that Britain is open for business. Heathrow is already the UK’s biggest freight port by value and a new runway would provide a post-Brexit boost for exports. Heathrow’s expansion would open up new links between the UK and markets around the world. It would connect UK goods and services to global customers and make the UK a more attractive location for inward investment. Expansion at Heathrow is also an opportunity to strengthen the frequency of existing domestic routes and develop new domestic connections from regional airports to London and new global markets. A third runway will double freight capacity at the airport and allow businesses across the country the opportunity to boost their exports. Heathrow Airport will be more accessible to the Midlands and the North of England thanks to HS2 via the interchange at Old Oak Common from 2026. We are also building on Heathrow’s pledges on compensation to put forward a world-class package worth up to £2.6 billion. This will include fully noise insulating homes, schools and community building most affected by noise and a Community Compensation Fund which could raise up to £50 million per year. Planning consent will only be granted if the new runway can be delivered in accordance with our air quality and climate change obligations. The Transport Secretary has also made airport noise for communities a top priority and will now have the power to review any changes to flight paths where they are of national significance. He also launched the Independent Commission for Civil Aviation Noise (ICCAN) to give communities confidence that any proposed airspace changes appropriately consider the impact of aviation noise. The measures will also enable greater use of new technology to manage airspace more effectively – helping tackle delays, cut emissions and reduce the need for stacking above our busiest airports.